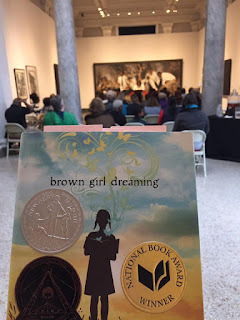 I got to read from one of my favorite books at our library's first African American Read-In last week. If you've not tried an African American Read-In at your library, you should think about it! It was a program that was easy to put together, easy to run on the day, and one we got great feedback about. We will definitely do it again next year. I am a librarian because I LOVE books. I know that libraries offer a lot more than books, but events centered around books and literature are my favorite kind of events to do at the library. The African American Read-In is completely centered on coming together to share books, so it is right up my alley. Lots of libraries and schools have participated in the AARI, so there are lots of ideas out there. And it's super flexible, so you can do what works for you. Basically, as long as your event features reading African American literature and is held during the month of February, it can be considered part of the National AARI. So get to Googling and you can see lots of different possibilities. We put the word out, invited a couple of guest readers to kick off the event, partnered with the theater department at one of our local schools to drum up some high school readers, and handled the rest of the readers open-mic style with a signup sheet. We held the event at the Carnegie Center for Art and History, which is a department of our library and located right down the street. They happened to have an amazing art exhibit going on: #BlackArtMatters, which provided the perfect backdrop for our readers. We brought books and a laptop check out station from the library so that attendees could check out the books that were read or sign up for a library card if they needed one. Our event was successful in many ways. I was hoping to have 50 people and we ended up with 65, which is great for us, especially for a new event. We got lots of great feedback from attendees, including many who asked if we'd be doing it again next year (yes!). I had hoped to have lots of books checked out from our mobile library station, but only two books were checked out, both by a staff member who was attending. So that's a goal for next year: promote checkouts of library material. I'd also like to explore getting children more involved and possibly hosting some after-school read-ins like Angie Manfredi posted about. There are definitely possibilities to expand the program next year. Have you done an African American Read-In? I'd love to hear about what you've done!